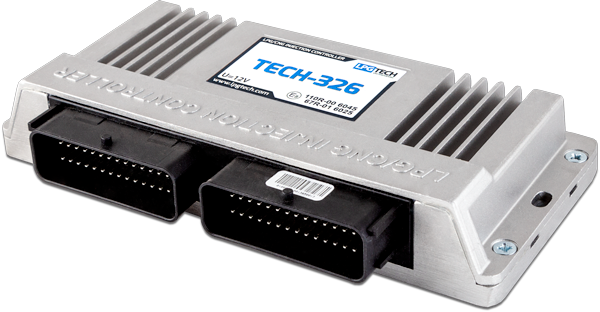 The TECH-320 controllers are microprocessor based in aluminum casing with the traditional 56 pin wire-set. The TECH-300 controllers are designed for up to 8 cyl. engines although, the two controllers could be connected simultaneously to be used in 16 cyl. engines. The compact casing 190 x 125 x 30mm enables easy installation in hard to reach spaces. The Standard TECH-324 version, consists of all above mentioned functions and protection guaranteeing excellent quality and performance. Auto-calibration and system settings should not take longer than 15 min. The advanced auto-adaptation system guarantees the trouble free installation performance by monitoring the system and, if necessary, correcting the gas injection times. The TECH-326 and TECH-328 are suitable for up to 8 cylinder engines (depending on version).